The Kirk makes a stunning venue for a wedding reception. Arranging your reception at the Kirk involves a lot of careful planning and preparation but it allows you to put your personal touch on the day within beautiful surroundings. The wooden floor is ideal for formal and informal dancing afterwards. The maximum capacity for a sit-down meal is 150 and up to 250 for the evening reception. The hire-charge includes time for you to set-up during the afternoon of the day before the reception and the completion time is midnight on the day of the event. Further information, including charges, can be obtained here. There are additional fees for extended set-up times, an hour’s extension to 0100, using own chairs and high-level decoration. Very often, hired-in tables and chairs are used to great effect. We are able to recommend furniture suppliers that have been used at the Kirk. 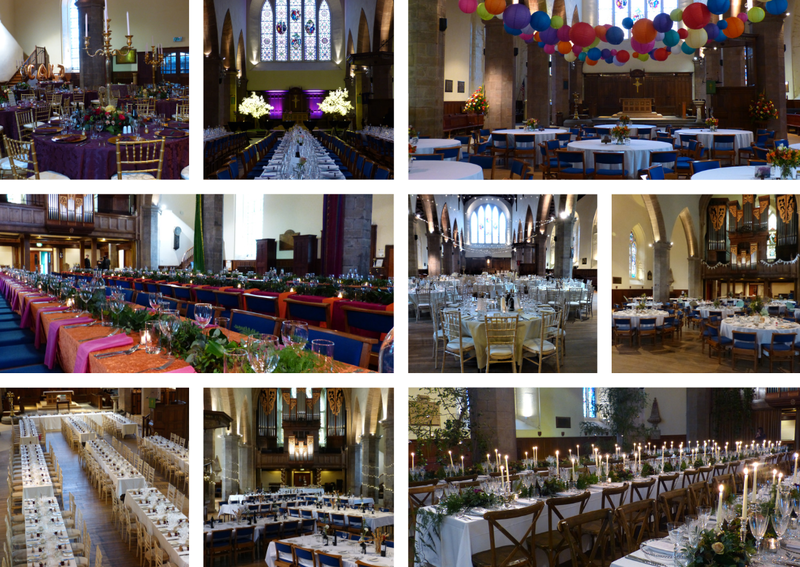 You are welcome to use the Kirk’s trestle tables and up to 300 blue chairs – as these are included in the hire fee. The side-aisle pews cannot be moved but can be used for informal sitting-out. Silver service, banquet, family style and buffets have all been provided in the Kirk. As for informal social events at the Kirk, kitchen facilities are limited. All catering equipment and tableware must be hired-in by the organiser. Catering providers that are able to operate at ‘outside venues’ are recommended and we are able to advise on those firms that have operated successfully in the Kirk. Alcohol may be consumed in the Kirk. However, a City of Edinburgh Council Occasional Licence is required prior to the operation of any cash bar facility. This should be arranged by the organiser and presented to the Operations Manager three days before the event. Bring your own bottle (BYOB) is not a problem and no licence is required for alcohol that is consumed without a monetary transaction. Please note that no drinks (alcoholic or non-alcoholic) can be consumed outside the Kirk. With safeguards in place to protect the floor and fittings, we are very happy if you wish to decorate the Kirk with floral, natural foliage and high-level decoration such as fairy lights. However please bear in mind that all the decoration must be taken down at the end of the event. On completion of the reception, the Kirk will be prepared for the next event and guests should vacate within 45 minutes of the finish time. As most receptions are on Saturday, the Kirk will be set-up for church! In order to facilitate this, you are required to ensure that tables are cleared completely within an hour of finish-time. The Kirk is able to store your tables and chairs used for the sit-down reception prior to collection on Monday. For weekday receptions (including Fridays), tables, chairs, portable bars, other furniture, catering equipment must be collected during the morning of the day after the event. Download our charges for 2019 here and 2020 here. To see additional reviews, click here. As a member of the Church of Scotland with full clergy team, the Kirk is a lovely and fitting place to arrange a wedding or special service. You do not have to be a member of the congregation and further information can be found here. We do not conduct civil ceremonies at the Kirk. All of our Weddings and Wedding Receptions must be booked via Steve Lister, our Operations Manager. Please contact him via outreach@greyfriarskirk.com or on 0131 225 1900.